Above are two flower postcards I have made recently. One was for a swap titled "What will the daisies tell...". 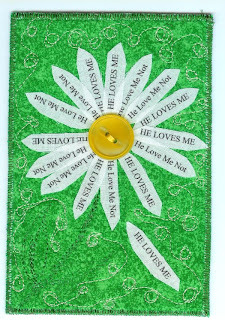 I printed the He loves me, He Loves me not on some white muslin and cut them into daisy petals. As I was ironing on the last petal I realized I had left out the "s" on He loves me not. I gasped and stared at the cards. I had a total of four on the table. The next card didn't have a flower theme, instead I had to use the word Feet as my inspiration for this card. 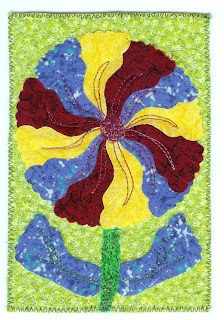 I chose to cut out lots of tiny feet and turn them into a colorful flower for summer. I think it turned out lovely.